Samuel and Elizabeth were married on 19 October 1854 at the Parish church, Cheltenham. At that time Samuel as a brass fitter living at Knapp Place. Elizabeth was living at Osborne Villas. Samuel's father was a labourer while Elizabeth's was a farmer. Samuel and Elizabeth were living at 49 New Street Place, Cheltenham when Alfred was born at home on 24 February 1860. At that time, Samuel was employed as a railway carriage fitter. According to the 1881 census, Samuel was born in 1828 in Cranmar, Gloucestershire and was employed as an iron fitter. His wife Elizabeth was said to have been born in the same year in Parfield, Gloucestershire. 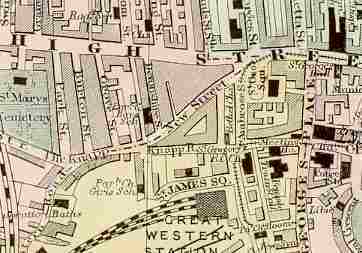 Unfortunately, neither Cranmar or Parfield appear in either modern day or 1895 place name indices. Cranham near Gloucester is a possibility for Cranmar. In 1881, the family, consisting of Samuel and Elizabeth with their 21 year old son Alfred and 11 year old daughter Ellen, was living at No 2 Taylors Court, Cheltenham. Accord to the Cheltenham edition of Slaters Commercial Directory, 1858-1859 there was only one Paynter family in trade. This was Paynter Thomas & Son (and manufacturer), Oxford pl., London road who were 'Paper Hangers'.